NEW YORK—Some stories deserve to be told and told again and again. 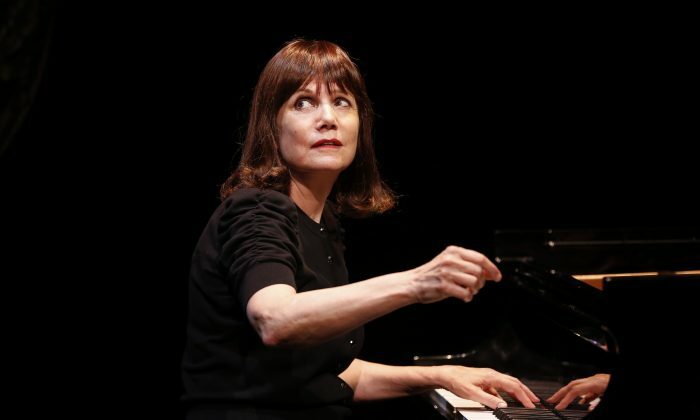 Such is the tale of Lisa Jura in The Pianist of Willesden Lane, now at 59E59 Theaters. The show is performed by Mona Golabek and is based on the book The Children of Willesden Lane: Beyond the Kindertransport: A Memoir of Music, Love, and Survival by Golabek and Lee Cohen. Golabek, who also happens to be Jura’s daughter, brings her mother’s experiences vividly to life in this one-person show. In 1938 Vienna, 14-year-old Lisa is taking music lessons and preparing for a career as a concert pianist. Passionate and determined, Lisa’s fondest wish is to make her professional debut at Vienna’s Muiskverein Concert Hall. However, Lisa is Jewish, and with the rise of the Nazis to power, 1938 is a not a good year to be a Jew in Vienna. Her father’s tailor shop has already suffered a loss of business, and when it becomes forbidden for anyone to teach Jewish children, Lisa’s music lessons come to an abrupt end. In the midst of ever increasing danger, Lisa’s father offers a potential lifeline. While gambling, a practice he’s been forced to turn to in order to bring in extra money, he wins a single ticket on the Kindertransport, a train organized by the British to take Jewish children to Great Britain. Of the family’s three children, Lisa is chosen to go and that very night is put on the train, eventually reaching England. After six months as a seamstress at a country estate, a position she leaves when she’s not allowed to play the piano there, Lisa is placed in a London hostel at 243 Willesden Lane. This place already houses more than a dozen other Kindertransport children, and the youngsters become an extended family as they exchange news and wonder about how their loved ones are doing back home. Now working in a garment factory by day and playing piano at the hostel by night, music remains Lisa’s one constant, one that allows her to keep a promise made to her mother on her last night in Vienna. A tale of one girl’s attempt to survive when the world was seemingly going mad, The Pianist of Willesden Lane is both intimate and powerful. Golabek’s personal connection to the material and accomplished gift for storytelling allows her to vividly recreate her mother’s experiences. These experiences include the disappointment and uncertainty Lisa feels when her father’s cousin in London is unable to take her in, her wonderment at seeing a piano at her first place of employment, and her abject determination to continue her musical career. Lisa’s determination is illustrated by her moving her fingers, night after night, silently above the keys of the piano she is forbidden to play. She also equates stitching and sewing to the performance of a musical piece, as well as plays the piano at Willesden Lane, even as bombs are literally raining down around her during the London blitz. Highlighted are various friendships Lisa makes while in London. Some children in the hostel help her prepare for an important audition. Her new music teacher gets Lisa a job as a piano player, thus allowing her to avoid the danger of ruining her fingers with all the constant sewing. Golabek’s delivery nicely gives life to the various characters. Just as music plays an important part in this story, so does memory. Lisa takes great pains to fix in her mind the Vienna of her childhood, her old music teacher’s apartment, and her family’s apartment. Lisa’s request to her mother to keep their apartment just as it is until they can all be together again is particularly moving. The story is given added emotional layers by Golabek, herself a concert pianist, playing numerous classical selections during the show, including pieces by Beethoven, Debussy, Bach, Chopin, and the Grieg Concerto. The latter is the piece Lisa hoped to perform at her debut. Direction by Hershey Felder, who also adapted the book on which the story is based, is taut, letting the sheer emotional power of the story take the lead. This is so much the case that you feel at times to be the only person in the audience with Golabek telling the tale directly to you. Scenic design by Trevor Hay and Felder, basically a bare stage with a piano, works well. Projection designs by Andrew Wilder and Greg Sowizdrzal, one which includes pictures of Lisa’s family and scenes of Vienna and London, are expertly done, all of which add the proper level of gravitas to the work. The Pianist of Willesden Lane will have audiences leaning forward in their seats with anticipation while their stomachs tighten with tension as the show does brilliant justice to a tale that needs to be remembered.